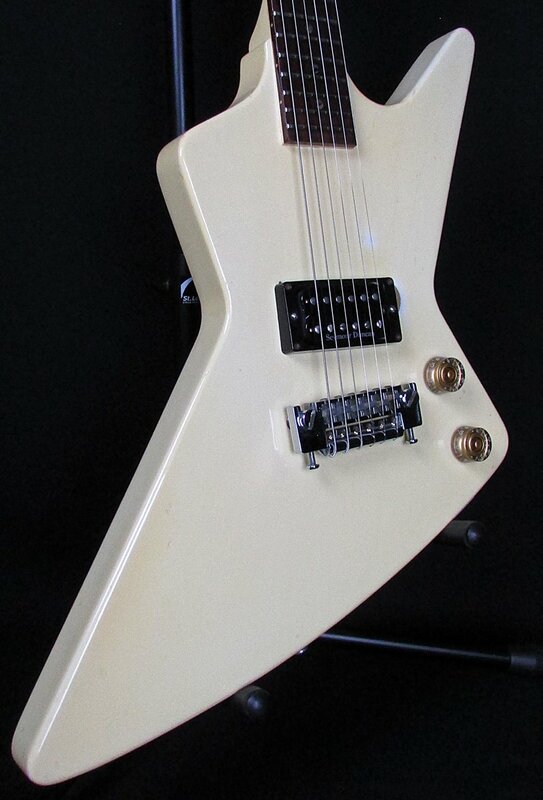 1982 Dean Baby Z Made in USA is in excellent condition and perfect playing order. Comes with the original hardcase. This mini explorer has had the original pickup swapped out with a Seymour Duncan SH-4 JB and a newer pickup mounting ring, which has a slightly different mounting pattern. On the treble side of the pickup is a finish wear spot where someone most likely rested their pinkie while playing. The finish has aged beautifully over the years and has some finish checking. Mahogany body with a set mahogany, slim, soft V profile neck, a rosewood fingerboard with 22 frets and pearloid dot inlays, this guitar is a lighter and smaller vision of the classic Z. Features a wraparound tailpiece with individual saddles. The guitar is in great playing condition with some cosmetic damage spread around the body and headstock but nothing that interferes with the playability or could be considered major damage. Has a 1 5/8" nut width, 24 3/4" scale length, and weighs 5 pounds 13 ounces.